It is believed that Zhabdrung Jigme Drakpa would watch from his zimkhang window, when his gomchen (lay monk) and village women practised for the annual tshechu. In his last 39 appearances as a dancer in the annual tshechu, Lhendup, who became a mask dancer from 18, said not a single dance has been performed at the goenpa courtyard without being routed from the Gangsa Pang. Every year, two weeks before the annual Talo tshechu begins, a group of lay monks and elderly women would arrive at Gangsa Pang, offers the first sacred offering and starts the practice of mask dances and folk songs. 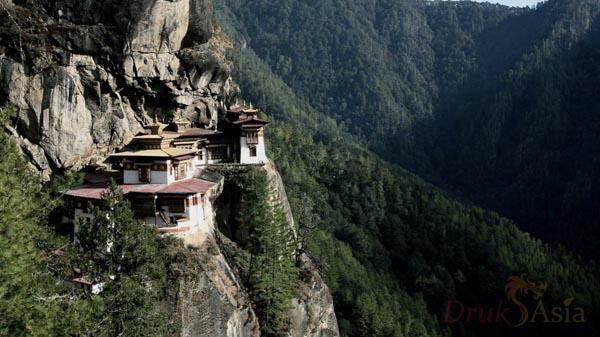 Simtokha Dzong - Five miles from Thimphu, on a lofty ridge, stands Simtokha Dzong the oldest fortress in the Kingdom. Dochula Pass - The 108 chortens was built by the present Queen Mother of Bhutan Ashi Dorji Wangmo Wangchuk to commemorate Bhutan’s victory over indian militants and to liberate the souls of the souls lost. Today is the last day of Talo Tshechu. The Thongdrel will be unfurled early in the morning and then the different mask dances and folk dances will take place. 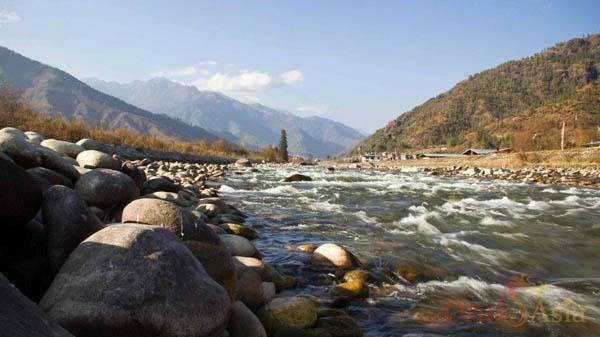 Talo valley itself is a very beautiful valley with lush green environment rich in both flora and fauna. The three day Talo Tshechu is well known for its mask and Atsara dances, but an equally popular attraction which has a deep religious and historical significance is the Zhungdra by the Talo dance troupe. The Zhungdra performance particularly Mani Sum (3 songs) are very close to the heart of the Talops (people from Talo). This is because Mani Sum was composed by Meme Sonam Dhondup, the grandfather of Zhabdrung Jigme Chogyal (1862-1904), the 5th mind reincarnation of the first Zhabdrung (1594-1651). The three songs of Mani Sum are performed at the closing item on each day of the three day of the tshechu. The three Songs, Samyi Sala(performed on the first day), Drukpa Dungey (second day) and Thowachi Gangi Tselay on the final day. Sami Sala was composed when the Talo Sanga Choeling dzong was built which was influenced by the Samyi Monastery in Tibet. Drukpa Dungey tells the story of the Zhabdrung Lineage and Thowachi Gangi Tselay is the thanksgiving song. Passing Wangdue (left), one of the major towns and district capital of Western Bhutan. 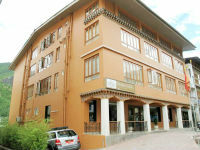 Located south of Punakha, Wangdue is the last town before central Bhutan. The district is famous for its fine bamboo work and its slate and stone carving. We will pause to view the Wangdue Phodrang Dzong. Built in 1638, Wangdue Dzong is dramatically perched on the spur of a hill and overlooks the confluence of the Tsang Chu and Dang Chu rivers. The valley of Phobjikha is well known as the winter home of the Black necked crane (Grus Nigricollis). Bhutan is home to around six hundred black-necked cranes with Phobjikha being one of the popular places that the birds migrate to in the winter months from the Tibetan plateau. The elegant and shy birds can be observed from early November to end of March. This is an old monastery that dates back to 17th century. Today we will do some short hikes around the valley of Phobjikha. We will pay a visit to Chhimi Lhakhang (left) - A 20 minutes walk across terraced fields through the village of Sopsokha from the roadside to the small temple located on a hillock in the centre of the valley below Metshina. Ngawang Chogyel built the temple in 15th century after the ’Divine Madman’ Drukpa Kuenlay built a small chorten there. It is a pilgrim site for couples wanting a child. National Memorial Chorten which was built in honor of the late King Jigme Dorji Wangchuk. Today is the 2nd last day of the Paro Tshechu. 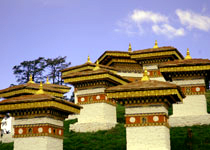 Paro Tshechu is one of the most popular tshechu in Bhutan. People from all walks of life and valleys come to Paro to witness the festival. Tshechu festivals, honors Padmasambhawa, also known as Guru Rimpoche, the precious yogi and saint who is credited with having introduced Tantric Buddhism throughout the Himalayas. The festival’s masked dances are performed by monks clad in colorful brocade attire and permeated by chants and reading of Buddhist scripts. The culmination of festival constitutes the unfolding of a huge cloth thangka, a sacred scroll, depicting Padmasmabhawa and imagery from Buddhist pantheon. The mere viewing of the thongdrel (thong-see drel-liberate) is said to cleanse the viewer of sins. Paro Dzong - also known as Rinpung Dzong, this 15th century massive fortress/monastery,is also the administrative center of the dzongkhag. Ta Dzong - Built as a watch tower the Ta Dzong, it was converted into the National Museum in 1968. The museum boasts antique Thangka, textiles, weapons and armour, household objects and rich assortment of natural and historic artifacts. I had long wanted to visit Bhutan. A country that stands apart in the Himalayas as it has been saved from the damaging effects of tourism that have affected the rest of Asia for the past 20 years. 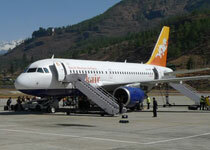 The rising of the popularity of Bhutan, however, cannot be denied. Slowly the country is throwing open its doors and coming out with new hotels, airports and flight connections. The high prices, on the other hand, will still keep the mass market at bay for a long time. Thank you very much on the arrangement. 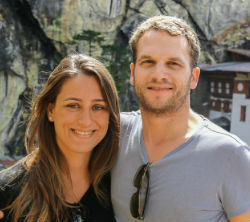 We were back from Bhutan, and would like to let you know that we had a great and wonderful time there. We would like to thank to the experience tour guide, KP and skillful Dorji. Both of them did a great job to show us around. Both of them are great and very helpful. By the way, I will give some of my friends your email address as after they have seen my posts @ Facebook. They want to plan for the trip to Bhutan. Just wanted to drop you a quick note in thanks. We had a great trip to Bhutan with your company -- everything was fabulous. Many thanks to Kuenzang and Uygin for taking such good care of us, especially my husband's parents. Please don't hesitate to refer prospective clients to me if they need a reference.